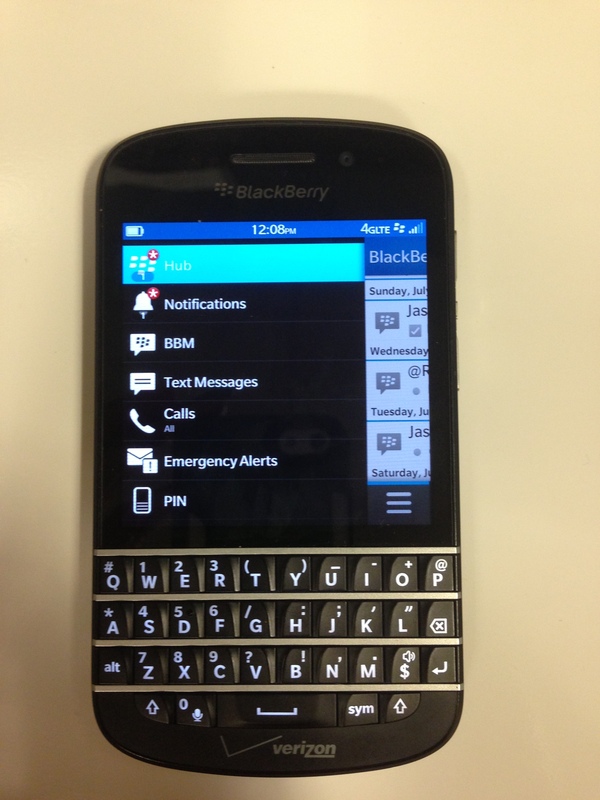 The BlackBerry Q10 is aimed at loyal BlackBerry fans who love the feel of a physical keyboard. How does it come to play with BB 10.1 OS and a touch screen display? Read details inside! I’ll be the first to say that I thought blackberry should have given up by the end of last year (2012). I was shocked when they had a launch event on January 30 of this year announcing a new OS and new devices.. They announced two phones. One was very similar to the BlackBerry Bold 9900 and the other one resembles a similar type of iPhon/bar device. 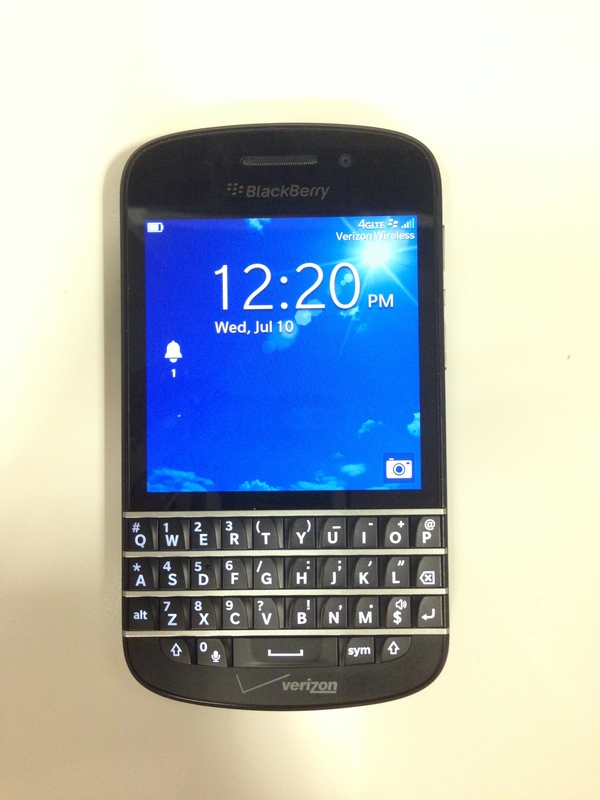 I will be reviewing the BlackBerry Q10 on Verizon Wireless. We all figured what they were trying to do with the BlackBerry Q10. 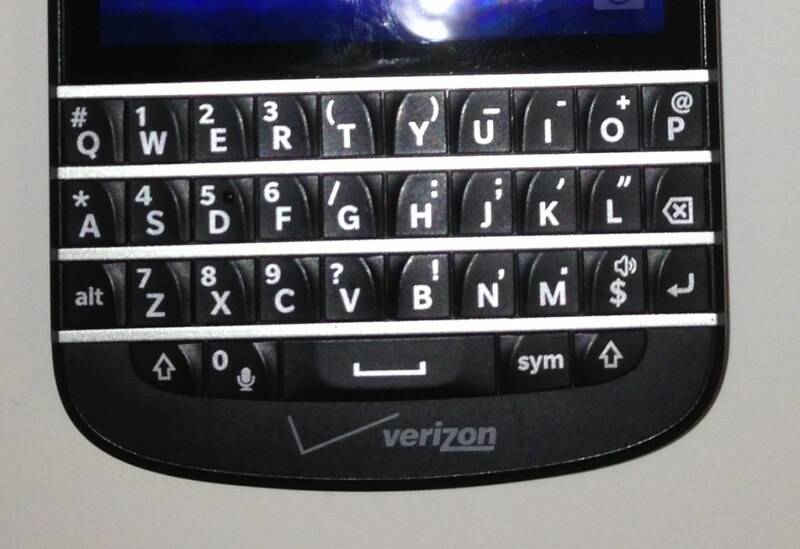 It’s basically appealing to BlackBerry loyalists who enjoy that body type and the QWERTY keyboard. The question is, does that keyboard hold up to what’s going on in 2013, where most phones have landscape keyboards or no keyboard at all. 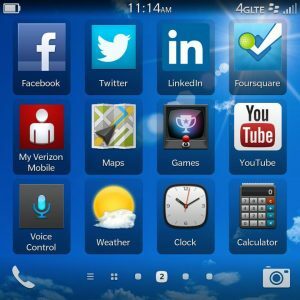 Similar to the BlackBerry Z10, the Blackberry Q10 has a lot of the popular social media apps, such as Facebook, LinkedIn, Twitter and Foursquare as well working directly with the BB 10.1 operating system. Now let’s get to the physical of this bad boy! 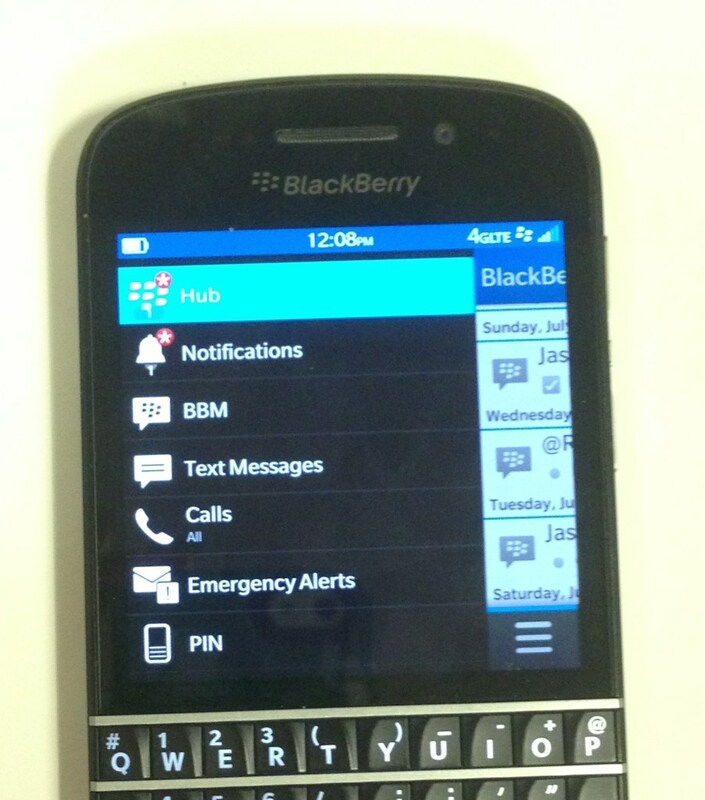 So when you see the BlackBerry Q10, it looks very very familiar to the old BlackBerry Bold. The screen size is 3.1 inches, Super AMOLED display. That display gives you a 720 x 720 resolution. That’s a high resolution for such a small screen size. The QWERTY keyboard is made up of four rows. On the top right of the BlackBerry sign you have the front facing camera with just two megapixels, and nearby the camera is the blinking light that had everyone addicted to BlackBerry in the past. On the left side of the BlackBerry you have the mini HDMI port and the USB charging/connection port. The right side has the volume rocker button down and enter button. The top border has the BlackBerry power button. To the left of the BlackBerry power button you have the be 3.5 mm headset jack. The bottom border has BlackBerry’s powerful speaker and microphone. The BlackBerry Q10 has 1.5 GHz dual core Qualcomm Snapdragon S4 processor and 2 GB of RAM; very similar to its keyboardless brother, the BlackBerry Z10. It has 16 GB of internal memory which of course are expandable to more with the micro-SD card slot. The BlackBerry Q10 is the first blackberry to come with the BlackBerry 10.1 operating system. As you probably guessed it’s not major, major changes to the software but his tweaks that helped enhance user experience such as copying and pasting numbers directly into the dialer. You can now also download attachments which is basically what most emails have. You can also personalize notifications. It also gave the camera HDR shooting mode. An interesting feature that has been added for the 10.1 update really goes hand-in-hand with the QWERTY keyboard. You can type in commands from any screen and the phone will do it for you. An example is “Call _____” and it will execute your command. I never thought that I’d be using a BlackBerry Q10. So getting back to a smaller phone with smaller screen size and full QWERTY keyboard was quite the task! Surprisingly enough the BlackBerry Q10 flowed between apps smoothly. It might be the 10.1 OS update or maybe some inside hardware optimizations. I do prefer a touch screen keyboard as I have been using them for about two years now, but the QWERTY keyboard on the blackberry Q10 was familiar enough where if you really needed a QWERTY keyboard I would definitely recommend this phone. When using the keyboard you will fall right into place and slants on the keys help navigate very well. It’s sad to say that the blinking BlackBerry LED like still has me powerless. Every time I saw it, I’d have to check the phone. 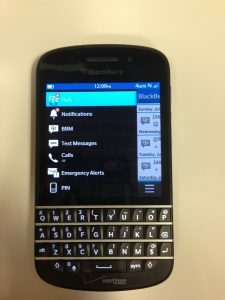 While the BlackBerry Q10 is strikingly similar to the bold 9900 there are many keyboard changes. The most obvious change is the top row that is missing. The top row has the control buttons. The five buttons were: the call button, the BlackBerry logo menu button, the trackpad button, the back or undo button, and then hang up button. Also the keyboard was kind of curvy on the old BlackBerry bold but on the new BlackBerry Q10 the keys go straight across. While the typing experience is different on the Bold 9900, typing on the Q10 is still a good experience. The keys have little slants that make it very easy for you to type without making errors. I barely made errors and I’m not used to a keyboard. I thought I would be typing a lot faster given that there was a physical QWERTY keyboard. But I think I type faster on a touchscreen keyboard. The way it click-clacks is a lot better though. It’s not as noisy and annoying as the old BlackBerry Bold and old BlackBerry Curve. However it has enough click noise to give you assurance of typing, which I believe it’s what most people like full QWERTY keyboards for; the assurance of the button being pressed. 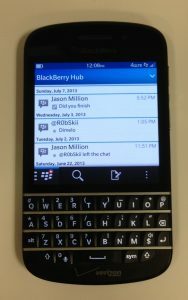 Is the BlackBerry Q10 does not have that row of command keys going home and going back, things like that are more gesture-based maneuvers. That is kind of hard and difficult to do with the 3.1 inch screen. The gestures start at the bottom of the screen, which is right above the top row of the keyboard. You have to “swipe up” for example to go home. That can be a little hard to do with that little space to start your swiping up gesture. It’s not really a big deal for me, but some may find it annoying. It’s definitely a learning process. Given that the BlackBerry Q10 has the QWERTY keyboard you would think they would at least put the home key to give the familiarity, but I guess they’re trying to merge the best of both the touchscreen and physical keyboard worlds. Overall using the BlackBerry Q10 was more of a “to-do work related tasks” experience I did not feel compelled to watch videos, or download a lot of apps. I’m an app addict. I mostly used the main apps which were Twitter and Foursquare is a pretty much have a very fitting user interface with the BlackBerry 10.1 OS. Using the phone in the summer wasn’t bad. I could see the screen decently on very bright summer days. Using the phone regularly wasn’t a hassle either due to the sturdy build and the material of the back cover. I don’t know if it was the screen size of the BB Q10 or the regularity of the camera, but it really didn’t pop out to me. It takes decent pictures. 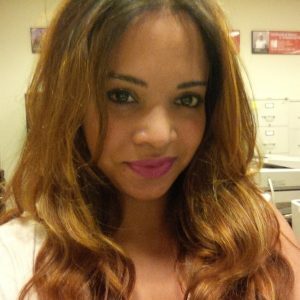 The pictures are better than old BlackBerry smartphones. It wouldn’t be my go to quick device for pictures. I wasn’t disappointed but I wasn’t highly satisfied either. The front facing camera did a decent job. Check out my selfie! As a phone BlackBerry has never failed me in the past. This is my first time testing a BlackBerry on Verizon Wireless 4G LTE service in New York City. As usual BlackBerry and Verizon didn’t fail me when it came to call service. I stay mainly around Queens, Manhattan. I did have to go to Brooklyn several times the last couple of weeks. I did’t have one dropped call on the BB Q10. I think it’s becoming rare to do so. But it was exactly what I expected from Verizon and BlackBerry, superb call quality experience. 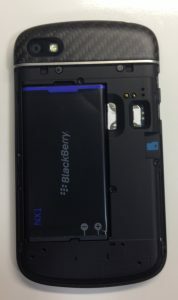 The removable 2,100 mAh battery lasted me more than a day on the BlackBerry Q10. It could be because the screen size is small and I was doing a lot less instagramming and picture taking. The BB Q10 charges through a micro-USB port so all my battery packs worked perfectly with it. I prefer to buy a universal battery pack as opposed to individual batteries. I feel that once you just see the Q10 you will decide whether you want it or not. If you must have a keyboard ( I know some who’ve yet to convert to full touch screen) the BB Q10 is definitely the way to go. You have a responsive smartphone with a sturdy build. The QWERTY keyboard will make you feel right at home. While there’s a bit of a learning curve with the gestures, it’s definitely worth the effort if you’re upgrading from an old BlackBerry. These little changes are good BB users, embrace them. 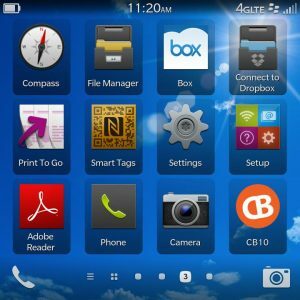 If the QWERTY keyboard isn’t your thing, the Z10 makes a better choice as you have more screen room for gestures and it should have the BlackBerry 10.1 OS update available. Have you tried the BlackBerry Q10? Are you afraid to move on from the classic BlackBerry Bold?